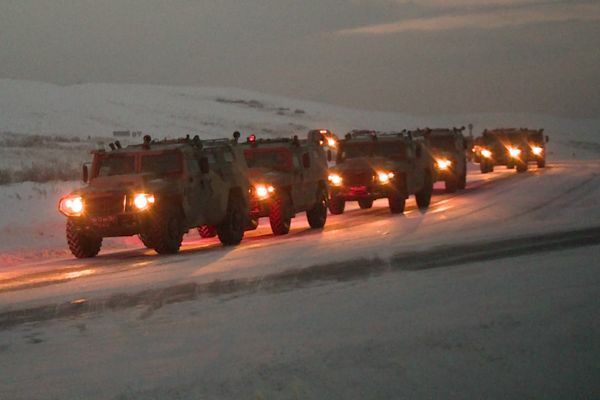 22 November, in the evening in the capital of Tuva came the first echelon 55 separate motorized infantry (mountain brigade) of the 142 soldiers. The head of Tuva Sholban Kara-ool called them "the first swallows", so the meeting on the parade ground of the new military camp was held with special honor. The soldiers were welcomed by the head of the Republic, government members, deputies, reports Tuvan Internet portal Tuvaonline. Divisions mountain rifle brigade of the Central military district (CVO) on the armored cars "Tiger" armored vehicles accompanied by helicopters of army aviation make March across Siberia in a military camp in Tuva, have informed journalists by the assistant commander of the CVO Colonel Yaroslav Roshchupkin. "Units of Fusiliers March for more than 1.5 thousand km across Siberia to built for them in the Republic of Tyva military town. At the final stage of a column of armored cars "Tiger" armored vehicles will be more than 400 km of its course at the Usinsky tract. After overnight in Krasnoyarsk village of Tanzybei technique will overcome Bobinski pass in the foothills of the Western Sayan mountains and will arrive in Kyzyl," said I. Roshchupkin. According to him, the column is accompanied by the helicopters of army aviation, in the path of the deployed positions of road commandant service and military police, as well as prepared engineering machine in case of snow drifts. "In the new town, which occupies the area more than 3 thousand hectares, commissioned military facilities, dorms, houses, dining room, gym, ice rink and Racecourse for transport and pack horses," added J. Roshchupkin. Traffic control equipment regional control centre staff of the CVO in Yekaterinburg, where interaction with local authorities and regional divisions of GAI. "Dear countrymen, fellow soldiers! Sergeants, ensigns, officers, major-General! My singular honour on behalf of the people, from your countrymen to welcome the dearest people. The best thing in life is the way home. Welcome to your home. We were waiting for You. Heartily congratulate You with this event. Literally on the field, built a strong military town. There was a vacant lot. Your town is now an area of three thousand hectares. At all times, in the most distant historical times, the feat of arms, the service of his people we, Tuva, was particularly revered. It is considered a man's job. Acted our ancestors, and today our soldiers have shown themselves the best and in Afghanistan and in the North Caucasus. I know that You are on the best traditions of military glory. Don't want pompous words, but we really waited a long time for you. We very much want that we have here, in Tuva, you were the best Tuvan separate motorized rifle mountain brigade. In 1943, the Tuvinian cavalry squadron had left for the war. It was the volunteers. Few have returned. And those who returned did not live so long. Today we held the last journey of one of the veterans of the great Patriotic war. I'm so sorry that the last soldiers of Victory gone. Now, their place is occupied by You. I know that military discipline You match this high example. Want, dear countrymen, Your service has been a respected society. You have a special status of defenders of the Fatherland. You people standing guard over the peaceful life. I know the glorious traditions of our Fathers and Grandfathers, preserved peace on earth will continue.The guys that came to serve here from other regions of Russia – a special honor! Our land is rich in its traditions and culture. Certainly, in the near future Tuva will become your home base. We wholeheartedly want it. I think a soldier's friendship will carry you through life. You want to strengthened their friendship, international, mutual support, help each other. Our land has never been, to people divided each other by eyes, we always had each other. As you can see, the climate is harsh. Hence the nature of the fight. Wish Your military work brings You pleasure and happiness. What You do is masculine. Be proud of it. In our country, many look at you, particularly pupils Presidential cadet school. There our children learn. There is a cadet boarding school. Your team needs for them to be a living example of exemplary service." The head of Tuva Sholban Kara-ool assured that the arrival of Tuva of the whole 55 separate motorized rifle (mountain) brigade will be marked by a parade. The brigade commander - major-General Andrew Chapter thanked the head of region on behalf of military personnel for the warm reception and gave his word that all military instructions will be executed. Just 55 separate motorized rifle brigade (mountain) are serving about 1,300 people, including 22 women. 1047 – Tuva people, 178 people of their regions. Fully personnel and equipment will arrive on the next convoy in the next few days. Recruitment began at the end of 2014. The soldiers were trained, intensive military training. This is a must for every serviceman under the contract. They were trained in the training centers of the Ministry of defence of the Russian Federation, to gain initial skills and knowledge. Military camp for accommodation of 55 separate motorized rifle brigade (mountain) in the city of Kyzyl was built from scratch. The total amount of construction works amounts to little more than 8 billion rubles. On the territory of the military camp located in the barracks, training building, canteen, brigade headquarters, battalion headquarters, checkpoint complex-storage building, residential building, town guard, a dormitory for 400 people, stables, other buildings and structures. The brigade commander - major-General Chapter Andrei. The brigade commander is the Deputy on work with the personnel, armament, combat training, and others. 55th mountain infantry brigade became a major employer and taxpayer in the Republic. According to preliminary calculations, the consolidated budget of Tuva will receive about 111 million rubles in taxes.